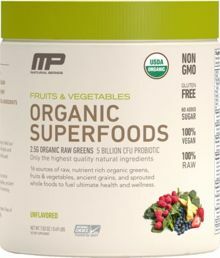 Mix one serving (1 scoop) of MusclePharm® Organic Superfoods with 8-12 fl. oz. of cold water, juice, or your favorite smoothie. ALLERGEN WARNING: This product was produced in a facility that may also produce ingredients containing milk, eggs, fish, shellfish, tree nuts, peanuts, wheat, and soybeans.